"Steve and Tim, I appreciate Marine Pro being in the Midlands. I race sailboats around the world on the grand prix circuit and I count on Marine Pro for doing grand prix work. 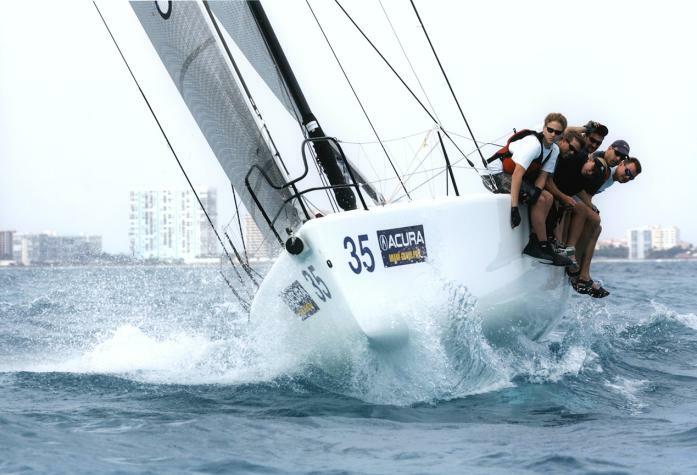 This is a picture of the Melges 32 off Miami and notice how the bow looks brand new, thanks to your fine fiberglass work." "I could not be more pleased with the work performed by Marine Pro. 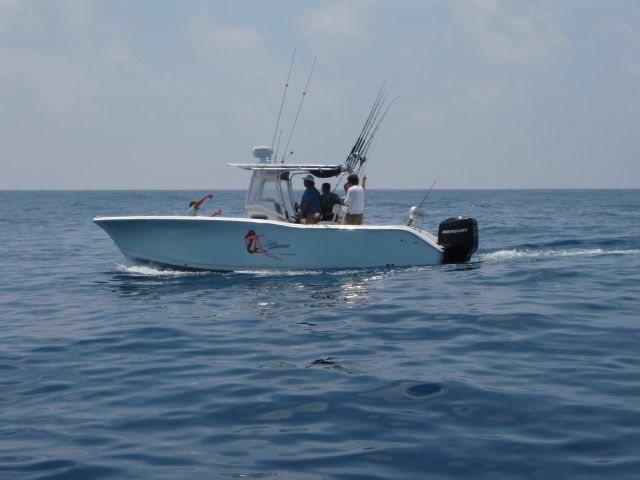 They completely replaced the transom in my 25 Talon, with twin 300's and is still perfect after 2 years!" "Steve, Tim, Ray, and John (Marine Pro staff) , Please consider this my formal expression of thanks for the professional job you guys did on our boat. You guys are truly what your company name implies "Marine Pro". The fiberglass repair, floor removal, T-Top repair, console removal and repair, stereo package, and care to details was superb !!!! The time it took for all of this to happen was unbelievably short and fast. I can't begin to tell you how proud I am of this boat since you guys did these repairs. It truly looks like a new boat and has even better stability than before. Thanks again and please let me know if I can ever be of any help." The Bill Porter family, Chapin, SC. I had an accident towing our 32' Boston Whaler down the interstate, in which a bearing seized on the trailer causing our boat to flip over on the interstate, busting in the fiberglass in the back and opening up our two-piece hull. They did such a great job repairing the damaged side that we got the entire boat repainted just to make it look as good as the side they worked on. Strongly recommend! I picked My 32 SC up from Marine Pro and it looks great. They were very professional and I could not be happier with the repairs. I would highly recommend you send more work to them. They also turned the boat around in a very short time. The facility and staff are large enough to handle several boats at one time, obviously improving turnaround time. Hey Stephen. Just picked the boat up and the floor feels much much much better. Y'all run a top notch business and do great work. Thanks again for all your help with the process and the fine craftsmanship. Wholly crap! I went by Marine Pro to see my boat today. The stereo is done and it is loud! Stephen and the guys at Marine Pro's are really Pro's! I hope everybody likes it loud, because it's going to be loud this summer. Big thank you to the guys. New ladder check, fiberglass fixed check, new graphics check, new swim platform pads check and giant kick a** stereo double check. Now when is it going to get warm? Thanks again for all of the quick work. Really like what you guys did - looks fabulous and clean. Also appreciate all of the excellent suggestions you and Stephen offered. Tell Stephen thanks again for me as well. "I just have no way to say how happy I am with the work you performed. The quality is so outstanding it defies anything I had hoped for. Please feel free to use my name in any reference and ask anyone to call me if they need to hear about your work from a satisfied customer." Monday- Friday 8:00-5:00, Saturday by appointment.